This is a guest post by Colleen at the Untrained Housewife website. 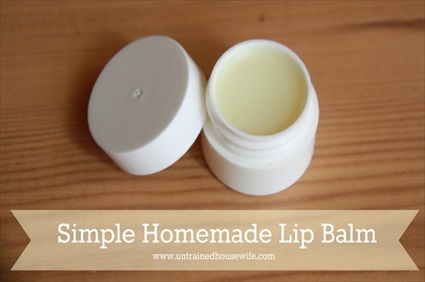 She shares her simple recipe for Homemade Lip Balm that uses just 4 ingredients. It’s a very easy recipe. The ingredients are listed on Page 1. The procedure is listed on Page 2. Please be sure to read Colleen’s note about using peppermint oil vs. using peppermint oil extract.